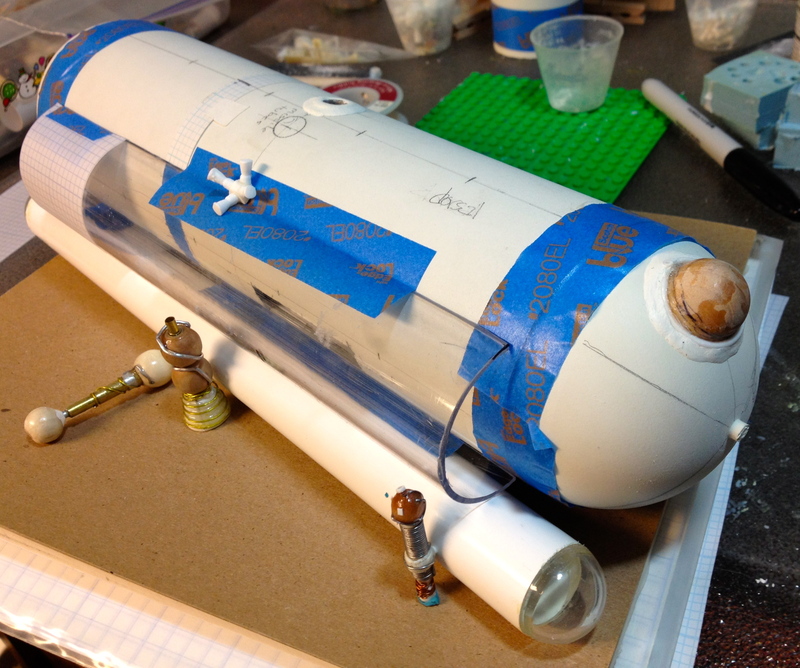 I originally thought of the Sissy as a simple with rounded ends…sort of like a modern submarine. But a sub uses that shape to equally distribute water pressure, and while the Princess Cecile has to withstand a vacuum, it probably encounters more stress from manuevers during battle than from any other source. (Drake notes that the ship rarely accelerates at more than 2 g’s.) Then I saw a set of 3D graphic images from someone on Flickr named xriz00 who did some beautiful renderings of the ship. (‘ve emailed him about posting one of his images here – no answer yet. Go onto Flickr and search for Princess Cecile and you will find his images as well as those from a gentleman named Marcelo Glenadel. His are more “realistic” renderings, if that’s the word…not as futuristic-looking, but more like I envision the ship should look. The other outrigger isn’t placed – I just put that one there to get a feel for it. The knobby thing in front is the prototype High Drive motor – behind it is the Mark I prototype HD motor that I ultimately rejected. The barbell-shaped thing behind it is not attached to the outrigger – it’s just there to get a sense of proportion. It’s a prototype oleo strut for the outrigger. The big knobby end would be embedded in the main hull, and the small one in the outrigger. I don’t think it’s too long…maybe. . I want to try casting it in resin to see how it looks. Patterns made of a bunch of dissimilar materials always look a little weird to me. The clear plastic half-tube taped to the hull is the new addition. I decided the straight cylinder looked too plain, and i still can’t see how you can stuff the drive systems, environmental, stores, missiles and living space for over a hundred people in that small a ship. So I added a bit of living room. Inspired a bit by the images I spoke of above, I decided the missile tubes should run the long way in the ship. I don’t recall Drake mentioning their orientation. The hole in the top of the hull was originally going to be a missile tube, paired with another that launched down. It will be some kind of access port now, I guess. 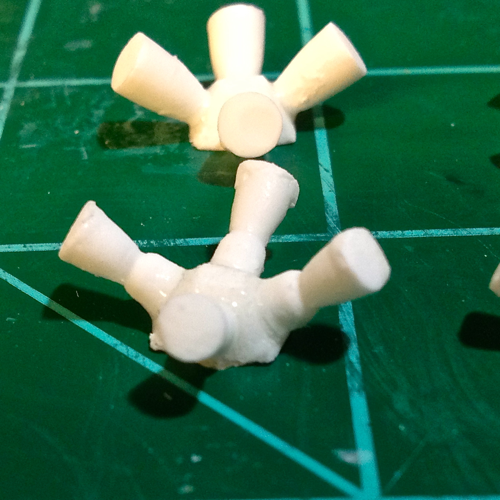 The turrets for the plasma cannons got a little dressing up with some plastic tube and some milliput. 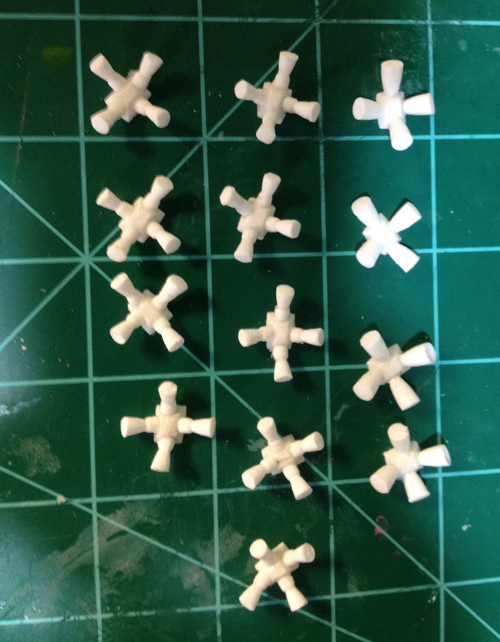 I’m sort of making them look more like tank turrets, I hope. I like the idea of using spheres as a primary shape a lot…it’s a shape not often used today on science fiction spacecraft, many of which are made to look really sleek and aerodynamic even if they are not atmosphere-capable. (That was the cool thing about the original series Enterprise – it sort of look airworthy, but you could tell it was really only designed to fly in space. Then they supposedly brought it into the lower atmosphere in the episode where they went back to the 1960s. Subsequent versions of the Big E got sleeker and sleeker, but I would hate to try to bring the Enterprise-D into an atmosphere. Oh, wait…they did, and crashed it. I forgot!) Of course, the ships designed by Fred Ordway and Harry Lange for 2001 had spheres, but they were based on real science and utility as much as possible…not art. 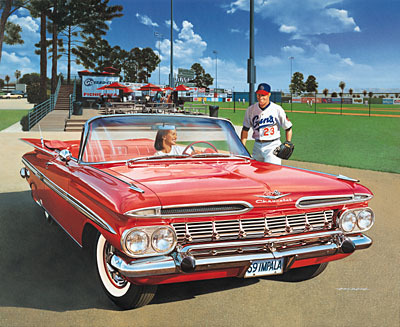 Sort of like a VW Bug vs. a 1959 Chevy Impala. So anyway, I cut a 2 inch diameter acrylic tube in half and I will attach half to each side of the hull. Not sure how the ends will look. 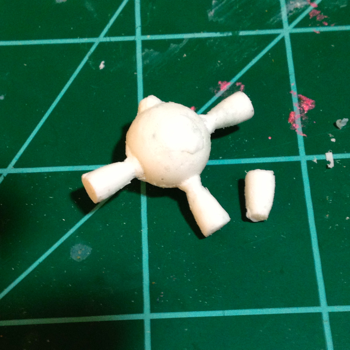 Maybe scalloped, maybe quarter spheres…I’ll have to see. Of course, now I have to cut another door for the main hatch. 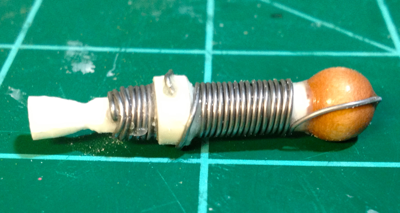 The styrene tube of the hull cut a lot nicer than the acrylic, which tends to melt on the Dremel. 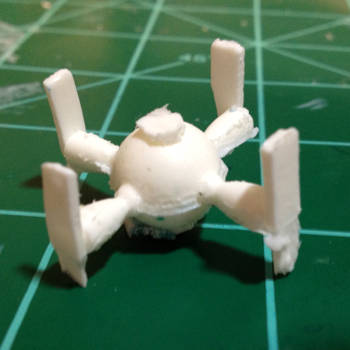 The thruster quads I was trying to cast in resin turned out to be a challenge. I tried several different molds, trying to make one as a one-piece casting with the mold in two halves, and as two separate halves poured, sanded flat, and glued together. In both cases I had problems with air bubbles or voids. Splitting it vertically in two helped a bit, but that still required getting the halves exactly flat and so they would line up when I glued them together. I learned a lot about the behavior of resin and moulding rubber, though! The more time I spent with these parts, the more I was convinced the quads were just too big. They would scale out to 10 to 12 feet across, nozzle to nozzle. Granted, a warship has to maneuver quickly and so they would need to be larger, most likely, than on a commercial spaceship. The trend today is that such thrusters would be mainly contained inside the hull of a spacecraft, I guess, if there is such a trend. 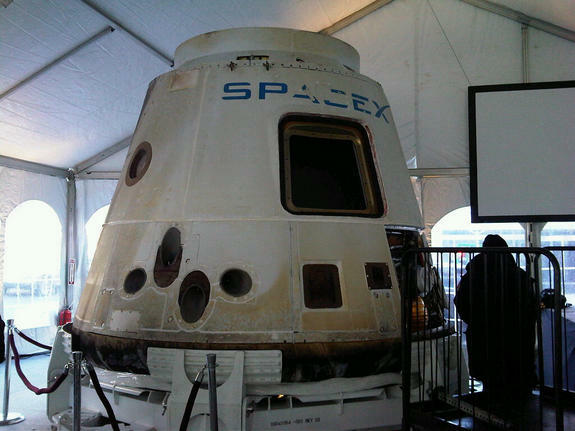 The thrusters on the SpaceX Dragon vehicle only show the openings of the rocket nozzles. You can see the thruster openings on the SpaceX Dragon – the four ovals below and to the left of the hatch. No doubt about it, the Dragon is a well-designed little ship. But she’s not a fighter, and (hopefully) she will never have to take battle damage. The ships of the RCN routinely are repaired during battle by the riggers, who wear armored spacesuits because there’s stuff flying around out there. Drake usually refers to the riggers as needing to repair the rigging and sails so the ship can re-enter the Matrix. The design of the RCN ships was predicated on making them as similar to sailing vessels as possible for narrative purposes, I think. One other point is that the RCN ships are built on steel hulls and are an interesting combination of high tech and low tech. In one of the books a ship is radically rebuilt on the ground on a mostly uninhabited planet. Just like the sailing ships of Aubrey or Hornblower, sometimes the crew finds it must effect major repairs without the benefit of a shipyard. So…I still wanted them on the exterior of the hull, so they could be repaired or replaced without quite as much danger of explosion. 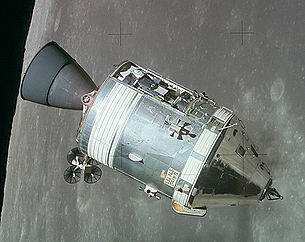 It didn’t make sense to me to have them located inside the hull placing a bunch of small (relatively) rocket engines where they could be dangerous to the crew, with openings through the hull for the exhaust. Test version of the new quad. The whole thing is less than 3/4 of an inch across. That still makes it about 12 scale feet across, but I think they will look more in-scale and they are about as small as I can make them. I may try making one with the “shoulder” on the engine bells removed. That would make it smaller, but it would also make it far more delicate – the nozzle throat is about 1/16 of an inch! I’ve not drilled out the engine bells. I should have done that first, with a pin vise. I’ll have to do that on the next set before I attach them. I think these will give the ship a bit of a “retro” look, which is what I’m going for, anyway. I don’t see the ship as a beautiful, streamlined aerodynamic vehicle – in fact, Drake notes than when entering the atmosphere too fast it is far too easy to tear the rigging right off the hull. This is a ship that does not enter an atmosphere ballistically. It is under power at all times. So, slow going. 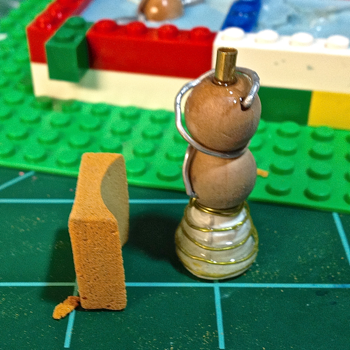 One other thought it to somehow create even smaller engine bells that would look more like the Apollo bells. I just don’t know how I would hold them on! 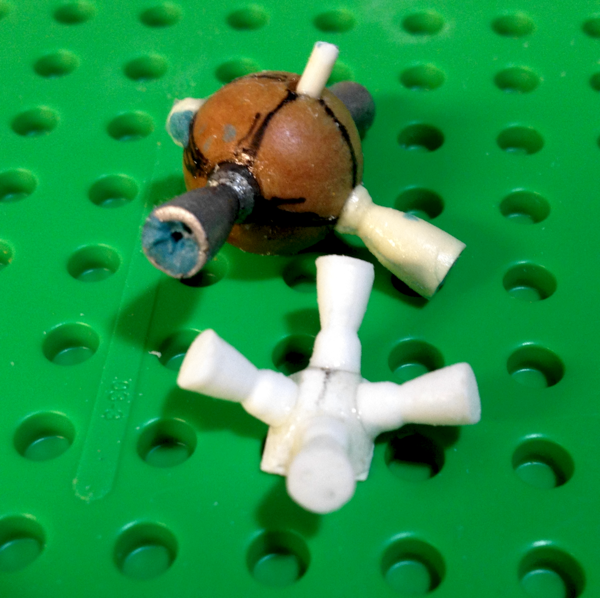 If you read the previous post on my scratchbuilding project, the Princess Cecile from David Drake’s Lt. Leary/RCN novels, you know that I have been working with resin casting a bit, trying to duplicate my master for the “thruster clusters.” I have a couple of issues with the design of the thruster clusters yet, including the fact that they are big – not big on the model, but in the 1:200 scale of the model they would be about 15-20 feet across! Each rocket nozzle would be about 5 feet tall. However, the ship is supposed to be 230 feet long and it should displace about 1300 tons, so moving such a massy object would take some pretty big thrusters. In particular, the thrusters on a warship should be oversized compared to a commercial vessel so that they can maneuver quickly in a battle situation. The Sissy must be nimble! So, I’ve been trying to get better results making resin castings of the master. The first mold I made yielded only far results, with some bubbles in the surface because I was overzealous in using mold release. 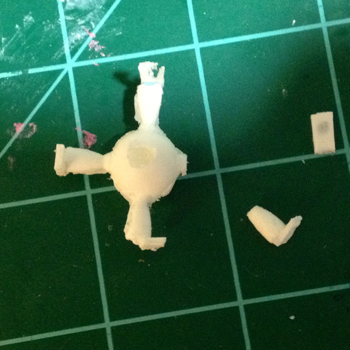 I also used the wrong mold release agent – stupid! I used the aerosol kind intended for making resin castings, not the liquid stuff used to keep the master from adhering to the master. I decided I needed to make new masters. I tried making them in the other orientation – with one nozzle pointing down – and making it in two halves that would be poured without putting them together. The problem there was that two thrusters would be made in halves, and the downward-facing one would be hard to pull from the mold. The technical term is undercut, meaning that the bottom of the nozzle has a larger diameter than the throat above it. That would require me to pull the resin copy out by forcing it through the rubber. I actually tried a couple of these and they, frankly, sucked. I decided that I would just make a better version of the first two-part mold. The master, sitting in clay, for the mold that didn’t work. The master that didn’t work, both parts. 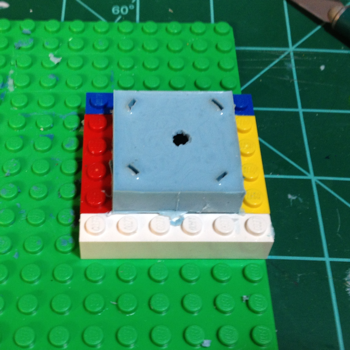 Both halves of the new mold, which looks a lot like the first one. I used big toothpicks to create the air bubble release holes instead of wire. Ugh! And the nozzle broke off trying to pull it out of the rubber. It was easier to pull out of the rubber this time, but it was still dicey. 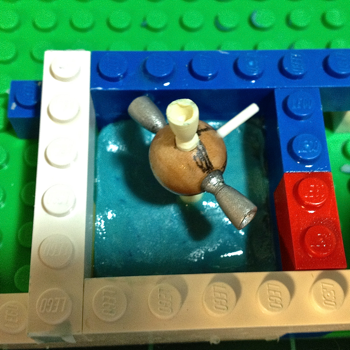 The problems pulling the copy out of the mold were reduced, but not eliminated. Those long slabs on the image above are the air bubble holes, filled up with resin. The resin flowed through the mold well, however, and there were no large bubbles. 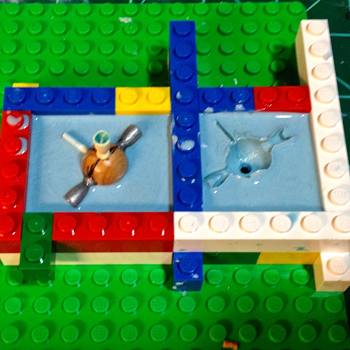 The other problem is that the very bottom of the mold is made of clay, not rubber. It helped hold the master upright when making the mold. A little comes loose with each pull, even after spraying it with mold release. This one looks a lot cleaner, though, and except for removing the plugs on the ends of the nozzles, this one will take much less time to clean up. By the way, while this one was curing, I cleaned up the other one to see if it was salvageable. I still have to find a way to glue that nozzle on. It would need more precision sanding before I would be ready to prime it. I’ve considered having a more complex shape made in CAD and then having it grown in a 3D printer. I just don’t have the chops with a 3D program to make that happen. I tried a couple of programs, but the free ones don’t seem to work very well and the cost of the higher-end versions – whew! There is an advantage to using these big thrusters on the Sissy, though. In the books, the riggers sometimes had to remain out on the hull while the ship moves in real space, not just in the Matrix. In the Matrix the ship moves by adjusting the direction of the sails, but once the ship was out, it often jumped right into the thick of battle. One of Daniel Leary’s skills is being the best astrogator this side of his uncle Stacy Bergen, who plotted many of the routes from star to star still used in Leary’s time. Leary could drop out of the Matrix closer to a planet than almost any other captain. This advantage meant that often the ship dropped out of the Matrix and right into the fighting, without having the time for the riggers to come back inside. Often they stayed outside anyway to cast off broken rigging before it fouled the guns or the missile tubes. So anyway, if the thrusters were smaller and closer to the hull a rigger could be in the way of the exhaust of the rocket engines. Bigger clusters put the nozzles higher, farther away from the hull, where they would be less danger to the riggers. At least, that’s my rationalization! I don’t think I like it. And i’s too big. This thing is about an inch and three-quarters tall. Since an average person is about 3/8″ in this scale, this motor would be almost 30 feet tall in scale! In one of the books – I think it’s “The Far Side of the Stars” – the crew has to install some High Drive motors on another ship while both are on land, not in the water. Adele had hacked into the other ship’s computer and re-routed the plasma thruster controls to the High Drive motors. Using High Drive motors anywhere other than in vacuum is very dangerous, because they operate by matter-antimatter annihilation. The result was that the ship was badly damaged, but the was repaired by the crew of the Sissy and sent back as a sort of Trojan Horse. Since the High Drive motors were destroyed when they were used on the ground, the crew pulled some motors off of a “country craft” that was abandoned in the jungle nearby. The description doesn’t make it sound as if moving the motors was an insurmountable problem, just with the resources carried on the two ships. It is mentioned that each motor weighs about half a ton. This is about the same weight as a SpaceX Merlin first-stage rocket engine probably weighs. I could see the High Drive motors as about the same size as a Merlin as well. 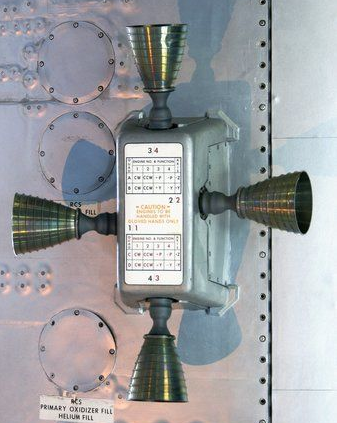 This puts them about the same size as one of the rocket nozzles on the thrusters. Part of the problem of the prototype above, besides size, is that the wire winding (which is to represent that used to create the magnetic field required for an motor using antimatter) is too big and probably beyond my skills to make prettier. A High Drive motor should be a device that generates and manipulates magnetic fields to control the mix of matter and antimatter. In the second book the High Drive motors are on the bottom of the main hull, all together. Later they are described as being on the outriggers, in case something bad happens. However, how do you send antimatter to the engines if they are on the outriggers? That’s almost a bigger problem than building the engines! 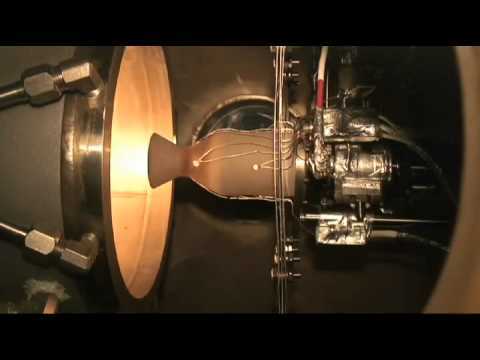 The motor may not even need a physical nozzle, since the antimatter can’t touch it. I think I have to look into antimatter engines more. Robert Forward described how to make ships operate using “mirror matter,” but not in detail for small motors like this. And most of his required just a little antimatter mixed with more regular matter, usually hydrogen, and superheats the un-annihilated hydrogen to use as reaction mass, as a sort of super-rocket engine. I know, you can’t study this so close or the physics breaks down! How do they make antimatter, anyway? They even have missiles with small High Drive engines on them, so controlling the magnetic fields must be old hat for these crews. I know – just ignore some of this and read the damned stories! But to build something that looks believable – well, I have to get my head into the RCN universe and extrapolate. A lot. My next project after this is the Alliance Space Ship Vorpal Blade, from the John Ringo/Travis Taylor book. It was built from the former USS Nebraska, a ballistic missile submarine! And it has a gigantic – well, sword – on the front! Doc Travis gets the science as right as possible, within the limits of storytelling. Giant intelligent chinchillas on antigravity golden surfboards? I just heard that Ray Bradbury passed away today, at the age of 91. He was one of the first four science fiction authors I read when I was young, along with Robert A. Heinlein, Isaac Asimov, and Arthur C. Clarke. From RAH I learned how to conduct myself as a human being, from Asimov to think far into the future, from Clarke the excitement of what could happen in my lifetime, and from Bradbury – that the future would not be without poetry. He was the less technical of those four by far, but the one with the best gift for words; his writing was less about the science and more about the wonder. He was less my favorite when I was in my “extremely technical” phase, but later I came to appreciate his work far more. Much later, of course, I learned to love Harlan Ellison’s work, but Harlan is…something else. Perhaps Ellison is sort of the anti-Bradbury, in a good way! Anyway, I’m sorry to hear of his passing. Now all of those big four are gone. I hope, for him, that “Mars is Heaven.” I’m sure he would like to be there, or in his beloved Waukegan of his childhood. I just wrote a piece about how the themes in Ayn Rand’s Atlas Shrugged are being used by liberals, and particularly by the Obama campaign. It can be found at Keep Americans Free! I invite you to read it, and to read Atlas Shrugged. How to write an account of a hospital stay. Mike Flynn, statistician and hard science-fiction author, recently went through having a kidney stone and the resulting infection. I had a kidney stone last August, but it didn’t turn into anything so bad, thank God. The difference here is that Mike Flynn is an excellent writer, and he posted a short narrative of his difficulties on his blog. He is a more than excellent writer, actually. His most recent books are difficult to describe – space opera with a decidedly Irish twist – if you can call it that. It’s complicated. Read The January Dancer. It takes a bit of persistence, at first, then it grows on you. His earlier works, especially the Firestar series, are near-future SF and are not difficult to get into at all. Eifelheim is a very odd book. It deals with an alien landing in 14th-century Germany. Yep. That’s what I said. Fourteenth century Germany. Aliens. Anyway, my hope for a very swift recovery, Mike! I’m glad Old Nick didn’t get you!